Fuller's Teasel (Dipsacus fullonum) is a species of plant. 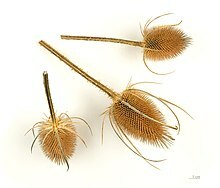 It is also known as Wild Teasel. It belongs in the teasel family (Dipsacaceae). It is native to Eurasia and Africa, and has been naturalized in the Americas, southern Africa, Australia, and New Zealand. This species grows to a height of 2–10 feet. The flowers are small and lavender-colored. They are arranged in an oval flower-head, which also contains many small leaves. These are hard and have a hooked and pointed tip. In ancient times, this plant was grown in gardens because its dry flower-heads were used to prepare wool for spinning. This was done by combing the raw wool with the flower-heads, so that the fibres were arranged neatly. The people who prepared wool were called "fullers", which is the origin of the plant's English and scientific names. Fuller's Teasel was also used in folk medicine, for example against skin infections. Wikimedia Commons has media related to Dipsacus fullonum. Wikispecies has information on: Dipsacus fullonum. This page was last changed on 20 August 2016, at 21:40.